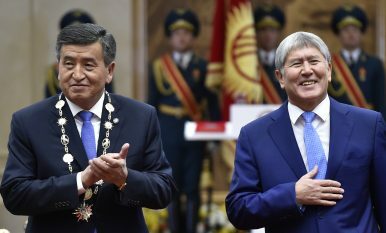 So long ago: Then President-elect Sooronbai Jeenbekov, left, and his predecessor Almazbek Atambayev greet the audience during the presidential inauguration ceremony in Bishkek, Kyrgyzstan, on Friday, Nov. 24, 2017. The first of two rival party congresses on April 3 sets up Kyrgyzstan’s biggest political party for a genuine split. Kyrgyzstan’s dominant political party is splitting. With parliamentary elections expected in October 2020, the shattering of the Social Democratic Party (SDPK) has implications for the balance of power in the state. In the first of two competing party congresses this week, on April 3 the SDPK Without Atambayev movement gathered 300 delegates in Bishkek to break with former President Almazbek Atambayev. Atambayev, who served as president from 2011 to 2017, was elected head of the party in late March 2018. One quirk of the Kyrgyz political system is that while presidential candidates tend to be put forth by political parties, elected presidents must withdraw from those parties for their term of office. Nevertheless, the political association remains in essence even if it is technically paused in the interest of serving the Kyrgyz people. This tension has become painfully clear as the rift between Atambayev and his successor, Sooronbay Jeenbekov, widened — even though both had been SDPK members. Before leaving office, Atambayev suggested he would retire from politics but he changed his tune shortly after stepping down. A month after Jeenbekov was elected (with Atambayev’s firm support) in October 2017, Atambayev vowed to return to politics and lead the SDPK in the 2020 parliamentary polls. Last month, the SDPK and the SDPK Without Atambayev movement announced separate party congresses. The SDPK, led by Atambayev, is expected to gather on April 6. Promising renewal, the breakaway SDPK gathering elected Sagynbek Abdrakhmanov the leader of the party (he was apparently the only candidate). Abdrakhmanov, it’s important to note, had been expelled from the SDPK in the run-up to the 2017 election after criticizing Atambayev and has led the SDPK Without Atambayev movement from its inception. Abdrakhmanov said he was supported by Isa Omurkulov and Asylbek Jeenbekov, though Kyrgyz media, like Kloop.kg, note that neither has commented on the matter, and 24.kg reported that Omurkulov convened the congress but did not attend. Omurkulov led the SDPK faction in parliament until November 2018, when he was expelled from the party. On the same day the SDPK breakaway faction held its congress, Asylbek Jeenbekov announced his withdrawal from the SDPK. According to 24.kg, the younger Jeenbekov said he would remain a part of SDPK faction in parliament, but has withdrawn from the party. We can expect Atambayev’s SDPK will similarly claim the party’s name on April 6 when it holds its congress — how this works out in reality is worth watching closely. In politics, there’s power in name recognition and the SDPK has been at the top of the political sphere for nearly a decade now. But the party is in chaos. That chaos creates both uncertainty and opportunity as parliamentary polls set for next year approach. April 6 is the ninth anniversary of the start of the 2010 Kyrgyz revolution. On April 6, 2010 protests in Talas against the government of then-President Kurmanbek Bakiyev turned violent. Nine days later Bakiyev fled the country and resigned from office. The SDPK looks headed for a split while former President Atambayev and his successor, Jeenbekov, lob fiery rhetoric.